Photo Courtesy of The Juneau Empire. Photo by Michael Penn. 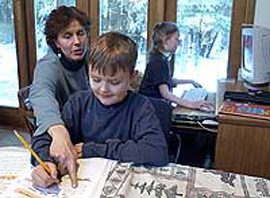 Children who are home-schooled do not go to school; instead their parents teach them at home. The home schooling movement began during the 1970s when some parents thought that schools were not teaching their children correct values. Other parents decided to teach their children themselves because they thought that public schools were too dangerous, or that they were doing a poor job. Home schooling is legal in all fifty states, and there are currently about one million children being schooled at home. State governments regulate home schooling, but there are wide differences in what states require. Some states require that students take standardized tests and undergo periodic academic evaluations, while others do not. Most states don’t require parents to have any specific educational qualifications in order to teach their children. There are advantages and disadvantages to home schooling. Children receive more individual attention at home than in school, and parents can provide them with a more flexible curriculum. Parents can teach the values that they think are important. There is no peer pressure for students. Critics say that children educated at home may not learn about different points view, or the values that are needed to become a good citizen.